Enough of this "let's all get along" malarky. We're here to conquer! H ey, remember how Ben Hogan discovered the secret of golf? Well, I've just discovered the secret of ToA, and it has NOTHING to do with Race Behavior 3! It can, in fact, be implemented using powerful custom races that you create using the in-game setup screens! Join this Empire in it's quest for 25 Million Points, and I'll show you the way the the 3-Million point character! The Twilight Pub is the bothyn of good-natured ToA stooshie. In other words, it is a place to fool around with different ideas, try various ToA tech trees, and completely disregard the competitive aspects of the metaverse. The empire is open, so anyone can come and go as they please. We're just here bumpin our gums and acting like blootered windae-lickers. Thanks to CL for the TwP logo! 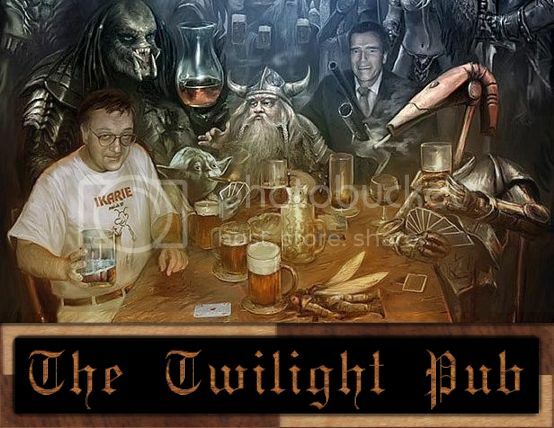 Welcome gentlemen, to the Twilight Pub! Pull up a chair next to the cozy fire while we draw you a nice stout beer and regale you with stories if intergalactic derring-do. Snark has asked me to explain, in English, what this new empire is about, and, just as importantly, what it is not about. This new empire is born of two ideas, both conspicuously absent from the Metaverse until now. The first is the need for an empire that focuses solely on Twilight of the Arnor and the interesting capabilities inherent to the racial tech-trees found therein. The second is the need for a place of neutral ground, where Kzinti's, ToE's, Geckodon's, Orca's, Adepta's and others can meet in a convivial place and share ideas and collaborate on strategies that relate to Twilight of the Arnor. We believe that TA is a lot of fun and that it doesn't get enough attention currently in the mainline empires. The Twilight Pub is not meant to be an empire in the ordinary sense wherein it will compete with the established empires for dominance. Your two Scots proprietors, CL and Snark, are from different empires, ToE and Kzinti respectively, and we both intend to stay loyal and dedicated members of those empires. However we noticed that most of the empire games are being played in DA and DL for point purposes. We both prefer playing TA and we discovered that we liked having someone else to chat with about game aspects unique to TA. Rather than ultimately being accused of cross species miscegenation we decided to bring our affection out of the closet and into the Twilight Pub. There are only two rules for enjoying the pub. The first is that the Twilight Pub is here to promote fun, specifically the fun of TA, and that all empires are welcome to whet their whistles here. Patrons are expected to be courteous, convival and fun. The second rule regards respect. Respect for your fellow patrons and respect for your empire roots. The Kzinti empire and the Tyranny of Evil both have their own secret strategies and game techniques. If you are privy to those secrets you are not to discuss them in the Twilight Pub. The Twilight Pub is a place where Kzinti's and ToE's can enjoyably collaborate in exploring NEW areas of TA. Everyone should feel safe and relaxed in the Pub and not have to worry about their empire secrets leaking. Your proprietors believe there is a lot of new ground to be covered in TA that has not been explored and that this represents a field where the empires can work together. But if you are rude, disagreeable, or especially if you share other empire secrets here, then the big, burly squirrel behind the bar will toss your tuckus out the front door and ban you from the Pub for eternity. We welcome all existing players and new players to pull up a chair, join the Twilight Pub, and play TA with us. This empire is not focused on banging out points or climbing the charts, it is focused on enjoying the unique game aspects that TA brings to the table. Join as a club member or just swing by as a guest from time to time, you will be welcome all the same. We plan on breaking new ground on specific TA strategies and discussing what we find here. We hope you enjoy the new clubhouse and look forward to enjoying your patronage. just gotta figure out which character to move. and do it. i'm feeling lazy today. PS: WHS is a lousy acronym for this empire. it makes me think "windows home server." I dinnae ken you were a Scots laddie! Welcome to the best club in the world Dys! (having a Scots heritage I mean, not so much the Twilight Pub). Welcome aboard! Twilight Pub! I like it! I'm changing the empire name. Well said, as always CL. Fun is what the game is supposed to be about. I'm having fun with the Korx now. In fact, I have almost destroyed the AIs before thay can finish colonizing my planets for me. My ultimate goal is to develop an easygoing strategy for schlaaarping up 300-400K in 4-5 years using the Korx and other stock ToA races. I like games that can be played in one or two days. The 700K point-grinders are nice on occasion, but get real old, real fast. aye, a quarter on my dad's side, clan hay. i have to admit though, i don't understand most of the scotspeak other than what i can garner from context. I might have to bring a character over as well. Especially when it's time to open up ToA. Well this is kind of cool! How many other quasi-Scots do we have floating around out there? Snark, where's your crest? 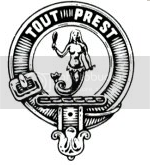 Everyone who brings their clan crest into the Pub gets three free draws or one single malt on the house! Motti & Dys you also get an extra round for volunteering them. 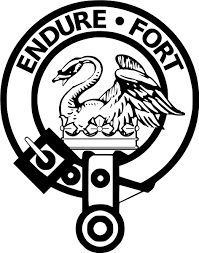 I think I have you all beat though....my clan crest is tattooed on my right shoulder, lol. Tomorrow I will put up some TA hints...just so we don't get too side-tracked on the Scots stuff and forget about the TA part. Hmmmm. Good question about the crest. I'll have to forage around. In the mean time, the moroculous squirrel will have to suffice. I think you'd win that bet. Although I did have mine done in silver. Maybe a distant second? I also have some plaques with the tartan, but they've been eaten up by moths. A shame, that. See the Twilight Pub's Tip of the Day! hmm... i went to my senior prom in a kilt (in a blackwatch tartan, since it would've been hundreds of dollars to rent a hay tartan kilt). does that qualify me for second? as for a tattoos... i think i could win if it were tattoos that prove you have the biggest balls... i won't say anymore than that, though the folks who've seen my myspace probably know to what i'm referring. Well, I have learned something about TA all on my lonesome. I started a new game this weekend and was playing a Krynn Superbreeder and I decided to go "evil" for my first time. I got the Mind Control Center and all of the planets had flipped to me by the 18 month mark. And that is where my game ended because the Krynn do not get the re-education center. Therefore every planet owned by a major race flipped to me. Since minor races don't flip, I was hoping that by keeping one minor race alive that the game wouldn't end, but nope, that didn't work. Once that last planet owned by a major race flips to you your game is over regardless of the victory conditions you selected at the beginning of the game. My score was pretty decent, 297k at 18 months, but I think this could have been a million plus point game if only I had the re-education center. My conclusion is that if you are going to play TA, and wish to play a long game for points, you probably need to select a tech tree that offers the re-education center....otherwise your game will end early on you. @Dys - I concede the big balls tattoo championship to you! Just downloaded TA 1.96...and I've got a spare character. I'm going to start a baseline Terran TA Game and make notes as I go along. From there I am going to play the other races and compare/contrast the differing techs and abilities to the baseline. Wish me luck guys, this may take awhile! Well, in support of my fellow ToE general, as well as in support of this great idea, I've registered myself at the Twilight Pub. I think this whole idea is very creative, and I believe this will help promote unity within the community, so kudos to CL and Snarkotamus for developing the Twilight Pub! Welcome Random70 and Cypher! We appreciate your support!!! I realllllly gotta get me a photobucket account. Well, turns out my latest Korx effort would have made for a dandy point-grinder. What a map...... Things are looking good for the 4-5 year score, which is all I intended. Should be done tonight. According to my brother, it means "Drink and Fall Down"
That's a noteworthy effort. Let me know if you need assistance. Windae Licker strikes an Heroic blow for the Korx. 11 Military Resources. I could have point farmed the googlywoompus out of this map! I even left 28 planets uncolonized. I'm going to go run it for another year, just to see what happens. Then I'll do a quick writeup for the TwP. Not a huge difference. No econ boom, and I had to keep lowering taxes to keep from loosing population. On the bright side, I only ended up about 50,000,000 BCs in debt! Good game Ser Arris! How do you post the image of the score here? I'm starting my first Twilight Pub game now. I took the advice from my other self, got a PhotoBucket account, made a screenie, uploaded same, and used the Insert/edit Image button. Here's something interesting. After I want hoplessly into debt from upgrading my cargp hulls to weapons-laden ships, I was still getting some very small Social and Military production. Next time, I'll have to see if I can use that in the strategy somehow. No more Windae Hingin Scotsman...well that abrogates the possiblity for a some jokes. Twilight Pub it is then! Welcome. Yep photobucket is my prefered site for images too. This is essentially an All Diplomacy strategy that is intended to produce a decent score in a fairly short amount of time. I set the Kork up as a Super Diplomat (SD), selected the Technologist Party, and put my bonus points into research, morale, and economics. I started with an x7 research tile on the home planet. I was looking for an x3, and just got lucky. I upgraded my space miner to a colony ship, and snapped up the first planet that the survey ship found. I then stuck with the three planets and researched until the end of 2227. After the first UP meeting, I was able to get the Drengin and Yor to start attacking other races so that I could avail myself of the Mercenary Academy. During 2228, I started collecting planets from the AI via trade. I had concentrated on diplomatic/economics techs during Year 0, so I was able to get a sizeable diplomatic advantage. By the end of 2228, I had the majority of colonized planets. On Feb 1 of 2229, I established treatys with the AIs/Minor Races, and collected every single planet that they were willing to trade. For the rest of 2229, I build 2 Intensive Farms and one Cultural Exchange on each planet, jumped on every available military, economic, and morale resource, researched, and built cargo hulls. I also built the Spin Control Center (SCC) early, and filled up the planet it was on with Psionic Missile-laden cargo hulls. I wanted to upgrade the other cargo hulls at the end of 2229, but had to wait an extra couple of months. I finally upgraded all 3800 of the cargo hulls to ships laden with Nightmare Torpedos. This is an Idea I got from one of Mumblefratz's posts in the Notes From a One Million Point Game (I think) thread. From this point on, I just kept mashing the Return key until it was time to finish off the single Korath planet, on which I had previously built a Reeducation Center on and given to them. There are a couple other things I want to add, but I am out of time. Time to go raid some bird feeders. I'll finish this this afternoon. Also, Invited GmOOnii to join us here, I have. Hope GmOOnii joins us here in the Pub, I do. Customizing your race portraits and planet logos. Would you rather have a scaly lizard or Miss April 2007 represent your empire? Tired of the same planet icons after months of playing? Learn how to make them look like whatever you desire......like orange cupcakes or bags of money!